At the American Society of Safety Professionals’ (ASSP) Safety 2018 Conference and Exposition, one of the sessions examined considerations for using the American National Standards Institute (ANSI) Standards 1264.1 and 1264.2 when developing a fall prevention program. According to an article from the EHS Daily Advisor, because these standards are voluntary, many safety professionals wonder if implementing them in addition to following the OSHA rules is necessary, and the ASSP session explored some of these concerns. One benefit of ANSI Standard 1264.1 is that by establishing minimum safety requirements and specifications for walking-working surfaces, such as stairway systems, guardrail systems, safety gates, floor openings and falling objects, it helps safety professionals advocate for better-designed surfaces. Though OSHA offers basic requirements for these surfaces, the ANSI standard expands on the rules and provides concrete parameters. Nevertheless, ANSI Standard 1264.1 isn’t perfect, according to the presenter of the session, ASSP’s outgoing president, Jim Smith. Smith said he believes the standard could have gone into more detail with regard to requirements for illumination, access and working surfaces on machinery, the accumulation of debris or water on stairs, and flooring hazards for same-level surfaces. 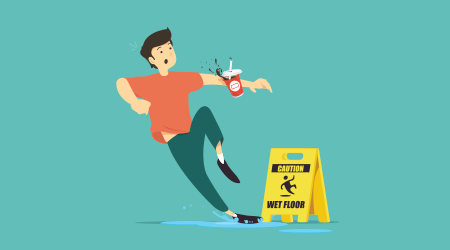 In any case, Smith said 1264.1 must be considered in tandem with ANSI Standard 1264.2 regarding slip resistance of the walking-working surfaces. Standard 1264.2 offers requirements for mats and runners, housekeeping, warnings, controlling access, and selection and treatment of flooring and by setting criteria for slip resistance and equipment testing.